These savory kafta patties are made with ground beef, onion, fresh parsley and traditional Lebanese spices. Perfect on the grill or under the broiler. Once upon a time, I made these for dinner and my 2 year old son at 75% of them before I got to the table. The End. Wasn’t that a good story? It’s actually a true story but honestly I was just so thrilled he loved them that I could hardly care. The truth is, I was upstairs nursing Jacob to bed and every minute or so my husband called upstairs asking if it was ok if Mr. Man kept eating all of the kafta patties. Note to Self: I need to start buying more meat to feed this growing little boy! Especially when it comes to Lebanese food which he loves as much as his mama. We love serving these patties with raw onion and bulgur pilaf but it is delicious with hummus, in a pita or served with Cucumber Laban Yogurt Sauce. Pre-heat grill or broiler to high heat. Place all ingredients in a food processor or high speed blender and pulse until smooth, about 2-3 minutes. Using wet hands, form into 12 evenly sized, small patties. Spray grill with non-stick grilling spray and grill patties for 2-3 minutes per side, turning once for medium-rare. Cook longer for well done. Serve over bulgur wheat or rice pilaf. My son is going to love this! And it seems so simple compared to the other recipe I usually use. Can’t wait to give it a try. Thanks for sharing! Let me know what he thinks Wanda! How did they turn out!?? Oh my goodness I’m so glad you enjoyed them!!!! :) Yay! Fabulous flavors, this must be amazing! Man, do these look scrumptious, Liz! I’d love to try them on a bed of rice, smothered with that yogurt sauce. And I’m talkin’ smothered. 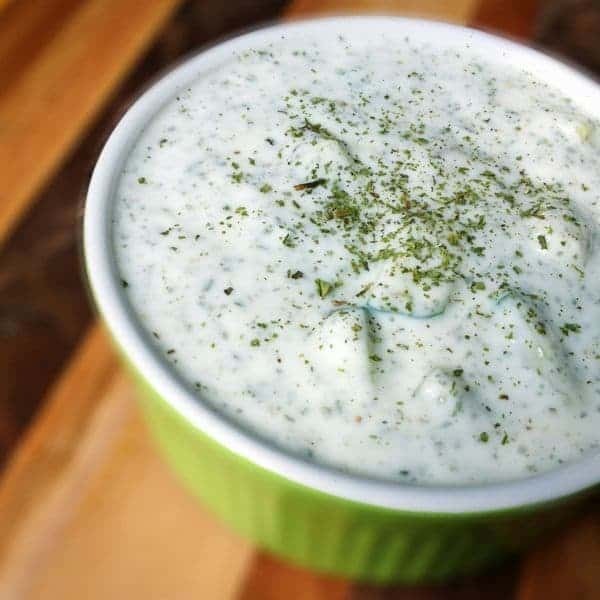 We’re big tzatziki fans over here! Hm, Middle Eastern recipe that I have everything for OR already have ingredients for on my grocery list? Count me in! Boyfriend and I had these burger-style, and they were delicious! He especially liked how the patties had all the flavors in them ready to go — no need for condiments. Love that story. My brothers and I used to eat like that. My mom could hardly keep up with us especially when it came to arabic food. I like the way you prepared it with the bulgur pilaf and raw onions. My kind of meal. You know I love these! I’m with Asher — I’d need them all. Seriously only 80 MG carbs?! Less than 1/10 of a gram?!?! Awesome!!!! Oops!!! It should be 5.7 g carb. 80 mg is the cholesterol. Recipe has been revised – so sorry for the type-o!! Still very low carb! I know what you mean, my 3 boys eat meat like little cavemen! With the spices going on in these patties my kids (and myself) are sure to love them! Cavemen is the perfect word!! These may be going on the grill this weekend! Even though I absolutely love them, I don’t use Lebanese spices nearly enough with meat. Delicious! I hope you love them Lori! Thank you, Liz, for the nice recipe. Have a Happy Day! My pleasure Liz! Have a great weekend! My mouth is watering just reading the ingredients in these. Amazing! I’m happy to hear that!!! These are so addictive and good – let me know if you try them!